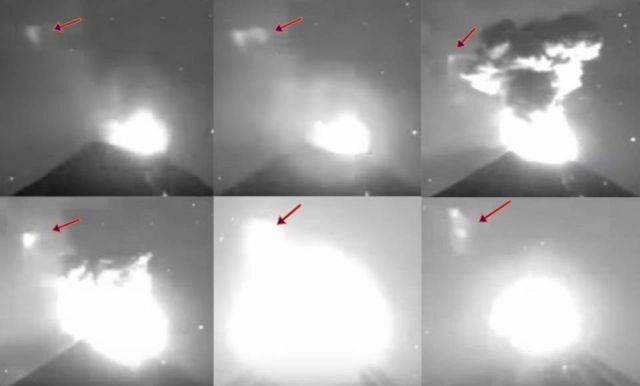 Triangle UFO over Colima causes massive outburst of the Volcano! Mexico's Colima volcano has erupted again. Last Friday, December 9, 2016 the volcano erupted four times in one night which forced authorities to evacuate hundreds of residents in nearby towns. During the eruptions something strange happens as it seems the emissions from the volcano hurtling towards an unknown triangle object which becomes partially visible above the volcano. What follows is an enormous outburst of the volcano and the object disappears again. On December 2, 2016 a similar incident happened above the volcano when a massive UFO appeared above the summit of the volcano. This triangle object could be a second UFO which gathers energy from the volcano's activities to recharge its power again? The video below shows the volcano erupting four times overnight and keep a close watch at the strange activities over the Volcano. If its cloaked its more than Likly Phased cloaked so it can stay invisible and yet not get damaged by the eruption.